In the distant future of the year 1992... war has returned to the galaxy. One thousand years have passed since the brave hero Angus McFife defeated the evil sorcerer Zargothrax in the battle of Dunfermline, trapping the wizard in a frozen prison of liquid ice. But now, a cult of unholy chaos wizards are plotting to release their dark master from his ice-bound tomb and once again unleash the sorcerer Zargothrax upon the universe. The tragic destiny of the Galactic Empire of Fife now hangs in the balance once more..
. Mighty warriors of the Galaxy. 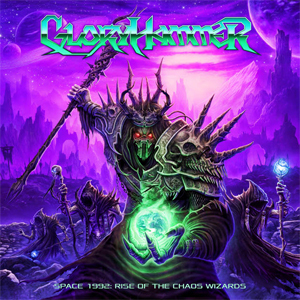 Today GLORYHAMMER has announced that their second album, Space 1992: Rise Of The Chaos Wizards, will be unleashed upon the universe on September 25th, 2015 AD (After Dundee) via Napalm Records. The album will feature 10 glorious battle anthems, which chronicle the legends of the Galactic Empire oO Fife.